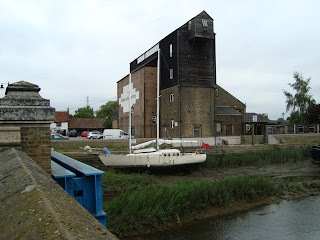 For as long as man has built boats there have been workboats. The earliest dugout canoes, primitive rafts, reed boats, kayaks, proas, curraghs and coracles were all used for particular work related tasks such as hunting, fishing, or for transporting people and cargoes. Builders of these craft learned the skills required for shaping their boats from local materials. Over time new materials and technologies were developed, which have made it possible for shipbuilders to fashion very large vessels like the oil tanker, ‘Knock Nevis’, which has an overall length of 458 metres. In this age of technology, all manner of workboats, from the smallest inshore fishing boat to the largest ocean tug, carry out their tasks for a variety of reasons, mostly for financial gain, but others for enforcing the law, providing safety and rescue facilities, guarding drilling rigs, or for maintaining offshore wind farms etc..
During my summer cruise aboard ‘Ladybird’ I took photographs of a number of workboats, including the Poole Lifeboat and a Falmouth Pilot. 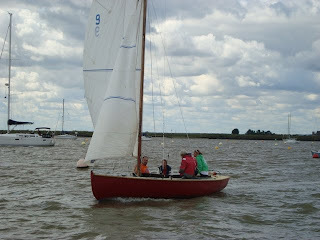 Well, we did get out on the water aboard ‘Ladybird’ today. There was a brisk wind from the north, which gave us sheltered beam reaching on the River Crouch, but I knew the situation would be quite different if we entered the River Roach, because returning to the Crouch would entail a tough beat against the wind and flooding tide. Knowing full well, from past experience, what would happen, I deliberately took the boat into the Roach, to demonstrate what not to do! We passed close to the Branklet Spit Buoy which marks the entrance; then we sailed downwind to a point beyond a group of vessels anchored to starboard. 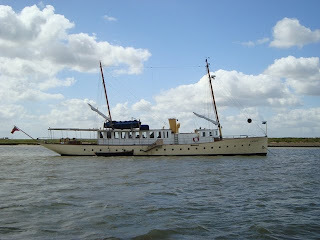 One of them was the classic motor yacht ‘Lilian of Stockholm’. She lay there quietly to her anchor, giving hardly a hint of the strength of the wind or of the speed of the tide. Having sailed beyond this elegant vintage vessel, it was time to demonstrate the difficulties we would encounter when beating back to the Crouch. This was to be a lesson for the tyro who now owns ‘Ladybird’. 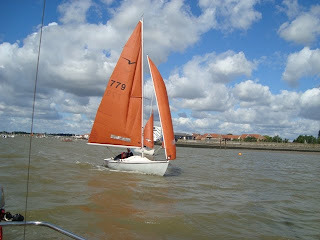 In fact, she’s not a complete novice, because she sailed a fair amount with me when she was a child. Now, it’s all coming back to her. Yes, you’ve guessed right. ‘Ladybird’ belongs to one of my daughters! Part of the deal was for me to teach her how to handle the boat. 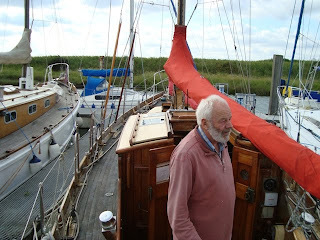 Our first tack brought us back to where we were before, i.e., close to the stern of ‘Lilian’. Our second tack gave us a few yards, and with perseverance we very slowly gained ground, but even after several crossings of the Roach we had only reached a point a few yards to windward of the bow of the ‘Lilian’. 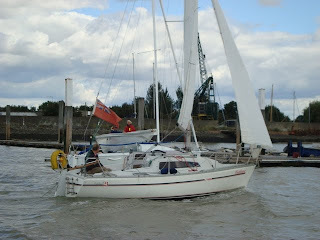 Therefore it was time to do a little motor sailing, and with the help of the engine, our progress greatly improved. Within minutes we were back in the Crouch where we kept clear of the Squibs as they raced towards the Burnham mark. After practising sailing on all points, heaving to, and lying ahull, we made our way back to the mooring for tea, and to practise chart work and to tie knots. A cruise experience is the sum of its parts. I look back on my summer cruise mainly as a pleasant one, but there were many different situations that made up the whole. An illustrative example of how parts make up the whole may be taken from the workings of the eye: receptors at the back of our eyes send rapid impulses to our brain, and these signals are interpreted as total images. In like manner, our experiences of situations are linked together as a continuum to form in our mind a general understanding of them as a whole. In light of the above, I cannot single out an experience that typifies the whole, but must consider the totality of the general experience. Therefore I cannot say that my pleasure was derived from seeing sailing vessels alone. In truth, I must admit to taking pleasure in seeing motor vessels. In fact, I was awed with the speed and power of some of them. 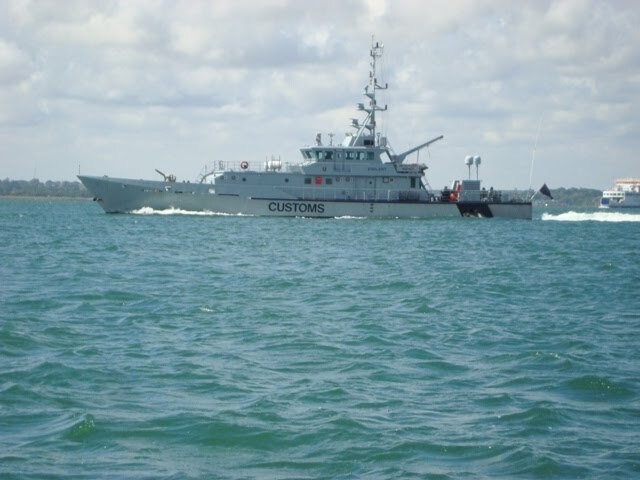 One vessel that comes to mind is the Customs launch that travelled at a rate of knots whilst heading towards the Needles Channel. 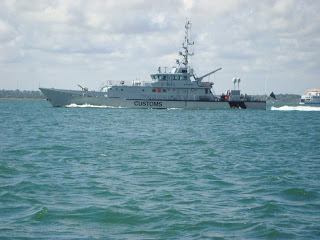 She could easily have been moving at 20 knots or more. 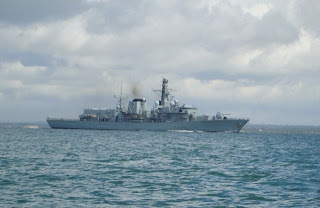 Then there was a Frigate on exercise off Portsmouth that moved as fast, despite her much larger bulk. Neither of these craft was as impressive as the ‘Balmoral’ cruise ship that I admired early one quiet morning in Dover Harbour. 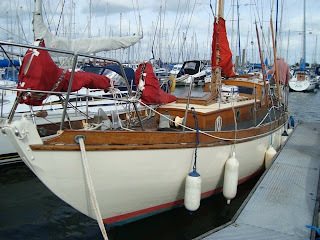 I was amazed with her less demonstrative power as she slowly and purposely revolved within her own length before gently settling alongside the berthing quay, without ruffling the water. I had a funny day. Things didn’t work out as planned. 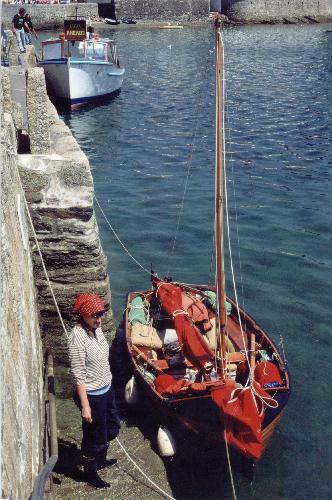 The idea was to go sailing with the new owner of ‘Ladybird’, but her car broke down and she didn’t make it. 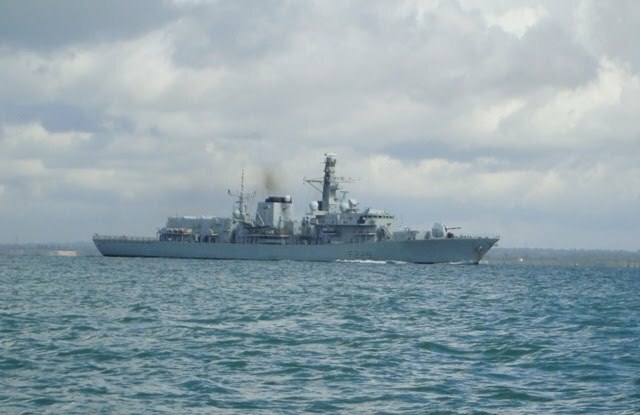 Instead of sailing, I spent time aboard her boat watching the comings and goings of various vessels at the beginning of Burnham Week. All manner of craft passed by, but as usual my focus was on the sailing variety. When they came within range I took my camera out, pointed it and hoped for the best. What with the movement of ‘Ladybird’, most of the photos turned out to be useless, because the horizons were all over the place. Burnham was packed …………. cars parked everywhere …………… visitors galore eating out on the terraces, watching the yachts and dinghies racing around the marks. 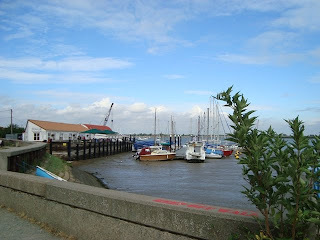 I went for a walk along the river front as far as the Marina where there was hardly room to move because of the cars. Talk of a turn down in the economy! There’s no sign of it here! – posh shiny everything, and no space left for yachts at the pontoons. Well, I suppose it is the Bank Holiday weekend. Why shouldn’t people have fun, take the kids out, eat ice creams, laugh and scream, walk and run with their dogs, watch them dash into the water and see them shake it off? Back at home after a hot bath, the world was fine. Another look at my cardboard model of Matt Layden’s ‘Swamp Thing’, and the world was positively glowing. Memories from my summer cruise along the South Coast of England aboard ‘Ladybird’ will remain with me for the rest of my life. That’s no exaggeration, for example, Portland Bill as seen during my hectic battle against the ebbing tide will remain etched in my memory. Slowly and rather uncertainly, ‘Ladybird’ lumbered northwards towards Portland Harbour. At times her speed over the ground was little more than a knot, but her speed through the water must have been at least four times as much, as she slithered down the face of crested waves. I daren’t leave the tiller for a second. A moment’s lapse of concentration could have resulted in a broach, with the inevitable consequence of the cockpit being filled with water. A second such invasion of water may have spelled the end for me and my boat. On reflection, I should never have taken the risk to pass over the western end of the Shambles Bank. I confess it was a foolhardy decision brought about because I did not fancy spending an extra two to three hours at sea before putting into Weymouth. I survived, but the memory remains, and it will be there as a warning bell set to ring, should I find myself facing a similar situation. Had there been opportunities for taking photographs of the wild seas that crashed and foamed around Portland Bill I would have pointed my camera and snapped away at them. Elsewhere, under more sedate conditions I was able to take photos of several headlands. More often than not, these natural landmarks were marked or scarred by man-made structures, such as lighthouses, coastguard buildings, etc.. Above, you can see a selection of these digital images. While I’m undecided which boat project to pursue, I’m keeping my options open, but at the moment I favour the concept of having a small boat that will protect me from the elements and one that will not require a boom tent for overnight respite. The Tideway dinghy does not meet these criteria, but she would be a good choice for day sailing. 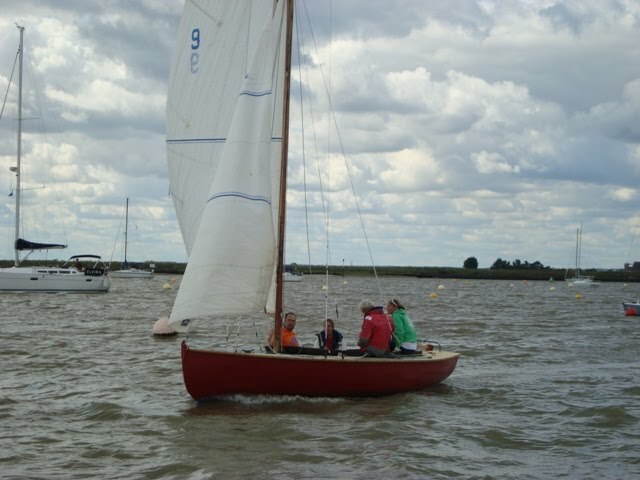 Now I know the Tideway 12 is very popular with members of the Dinghy Cruising Association, and that she has been cruised extensively by hardy souls who would not choose any other dinghy. The same could be said for both the wooden version of the Tideway 12 and the GRP one. Why are they so popular with cruising folk? Perhaps it is because they are stable, reliably strong, and they have the capacity for carrying plenty of cruising gear. They can be launched and retrieved without difficulty - even by a solo crew, providing the slipway is not too steep or slippery. They are not demanding to sail, and the crew sits in them, rather than on their gunwales while trying to keep their boats upright. Like all such dinghies, it pays to reef early, so that gymnastics are not required. Their Gunter rig spars fit within the boat. They can settle on a gently sloping beach so that their crews can have a peaceful night’s sleep. The photos above were given to me by Roger Barnes. They were used to illustrate an article written by him that I published on my old website. 'Ladybird' when she was at Cowes. 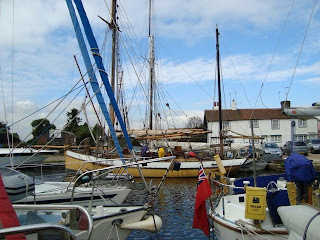 Every two years or thereabouts I like to take on a new boating project, and now is the time to decide what to do. Having sold ‘Ladybird’ I am free to make a start, but I have not made up my mind as to the nature of the project. 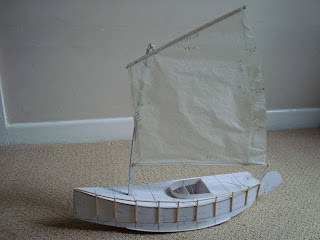 I am exploring the possibility of building a small boat similar to Matt Layden’s ‘Elusion’. 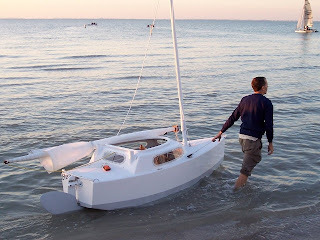 (See my previous Blog with photographs of her: http://bills-log.blogspot.com/2010/03/elusion-matt-laydens-micro-sailboat.html ) Her allure is proving to be irresistible, which makes me think that I shall not be satisfied until I have a similar little boat for my very own use. What makes this tiny vessel attractive? Well, she has several desirable features. For me, at this time, minimum expenditure for maintenance and storage rank well up on the list of ‘must haves’. I need something that will occupy my spare time, and building a boat that will fit into my garage could satisfy this need. As I get older I feel less inclined to sail long distances; therefore the sort of boat I should be looking for is one for weekending and day sailing. My Paradox, ‘Faith’ fitted this role pretty well, but she was a bit of a handful when I had to launch and retrieve her on my own, particularly if the slipway was steep and exposed to the waves - more so if there was a transverse current. Perhaps if her trailer had been fitted with docking arms, things would have been easier. I am also toying with the idea of buying a sailing dinghy, but going back to open boat sailing, without the protection from the elements provided by ‘Elusion’ does not really appeal to me. 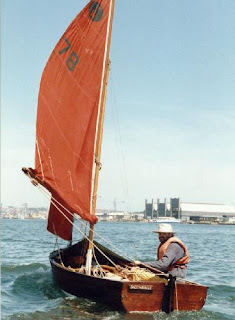 My Roamer dinghy was an excellent cruising boat; however, exposure to the elements was a problem, and setting up her boom tent at the end of the day was always a fag. 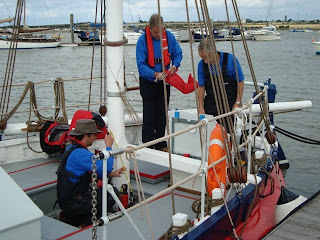 This was more of a chore if the boat had been drenched with rain or was wet with spray. Because of these things, a dinghy is not as attractive to me as an ‘Elusion’-type micro-cruiser for weekending. 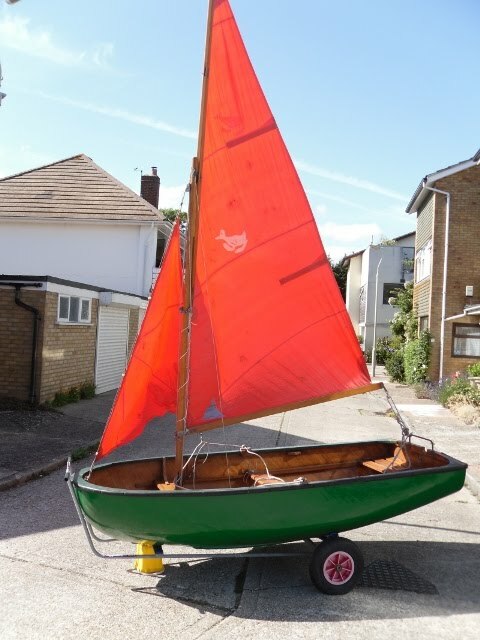 On the other hand, a small, easily managed dinghy could be satisfactory if I only wanted to day sail when the weather was fine. I would like the option of being able to spend a few nights aboard my next boat without the hassle of rigging a tent, and Matt Layden’s little boat would meet the criterion. She also provides around the clock protection from exposure for her solo crew. Add to that the fact that she’s smaller than many dinghies, therefore she should be easy to get on and off her road trailer. The problem with building an ‘Elusion’ clone is that there are no plans available. I would have to design one for myself, perhaps by using a proprietary computer program, or by making a model for determining offsets, or simply by shaping the boat directly from raw materials, as a sculptor may carve into wood or chisel into stone. With any of these methods, the result could be disastrous! All that is required of me is to make a decision to go ahead, start the chosen project, persevere with it and overcome obstacles that may come along, then accept the end result. The journey to a completion should be fun, and if the project works out satisfactorily, sailing the boat afterwards should be satisfying. I’ve owned a number of yacht tenders. Two of them were folding dinghies. All of them were made from plywood or moulded from GRP. With one exception, I bought them second-hand. The exception was my folding Seahopper which I acquired in 1984. 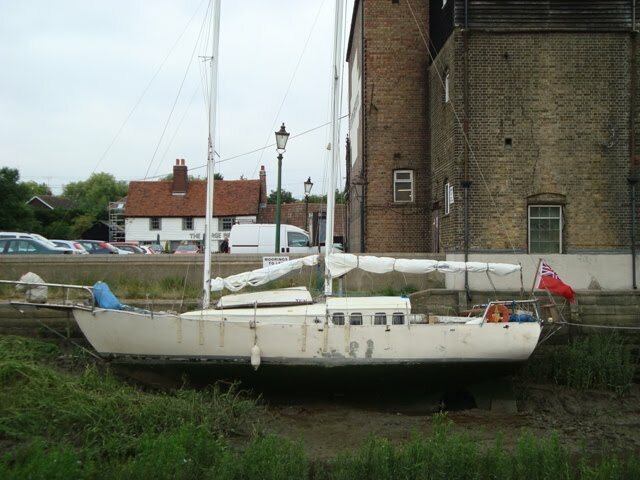 Two years ago I glassed her chines to strengthen her for use as a tender to ‘Ladybird’, but now I no longer own the yacht or her tender, because I have accepted a generous offer for them. If I were thinking of getting another tender, I would seriously consider a Fairey Duckling, designed by Uffa Fox. Ducklings were manufactured by Fairey Marine at the Isle of Wight. 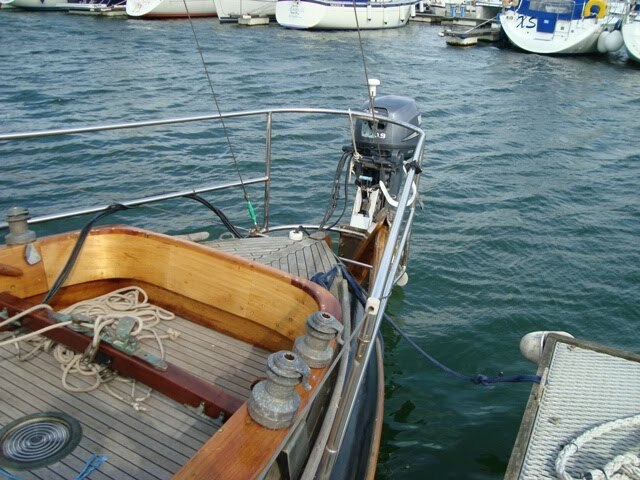 They were produced in the early sixties, along with a range of sailing and motor yachts. Like these bigger boats she was formed by a hot moulding process developed during the Second World War for building wooden aircraft. Veneers of resin impregnated agba were welded together under pressure by a vacuum bagging process. 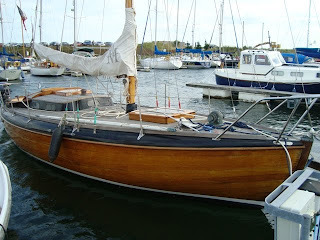 The result was a relatively lightweight, very strong wooden hull, free of internal frames. After 50 years of continuous use, quite a few Ducklings remain in service, which is a testament to the durability of resin impregnated agba. These rugged dinghies can carry up to three people, plus their gear, and still have acceptable freeboard. Most Ducklings are equipped with a sailing rig consisting of wooden spars short enough to fit into the boat, a Gunter mainsail and a small jib, plus a daggerboard and a kick up rudder with a tiller. • All up weight for rowing 100lbs. I am always on the lookout for new boats, and a friend has asked me to tell him what I think about a new French style, micro-cruiser. She is a little, two man yacht with a lifting keel and twin rudders, that looks a bit like a Mini Transat 6.5 racing yacht, but smaller. 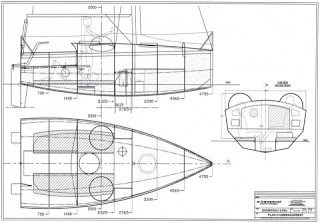 Thanks to the efforts of her designer, Eric Henseval, a fair amount of information about his 'Souriceau' is available online. My observations can only be based on the info I’ve been able to obtain from the Internet. My first thought was that she would be a comparatively expensive boat to build, because of her numerous fittings, and in this respect I questioned the need for two domes and two rudders. 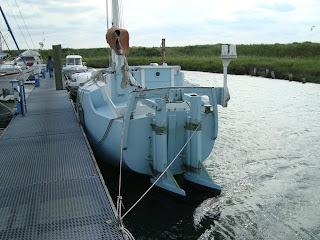 Further examination revealed that when ‘Souriceau’ dries out on a flat surface, she settles upright on the bulb of her retracted keel and the tips of her splayed rudders. Without twin rudders she would flop over on her side. However, I would be concerned that her rudders may become damaged, during the settling process. 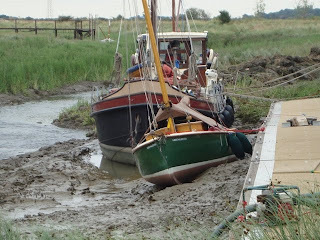 Likewise, I would be equally worried for the rudders when the boat starts to lift on a rising tide. I would be very anxious if there were rocks or small boulders in the vicinity. I questioned the need for a cockpit, since it reduces her interior space, and gives little protection or security for her crew. I noted that she has single chainplates for her double shrouds, and she does not have a backstay, which, for an ocean-going vessel, may be an oversight. 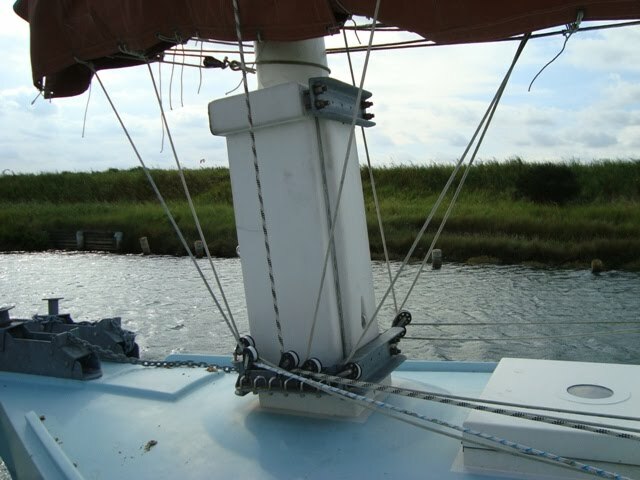 Optional running backstays would minimize the risk of rigging failure, and if her owner wanted to sail her across an ocean, he may consider adding a second forestay, not just for making the rig more secure, but for setting twin foresails. I think she would perform well at sea when the wind is less than Force 7, but her dart-shaped hull may make her vulnerable when running down the face of steep waves, because her very pointed bow has little internal volume for lifting her foredeck clear of the troughs. If she where to bury her bow, she could be pitchpolled. 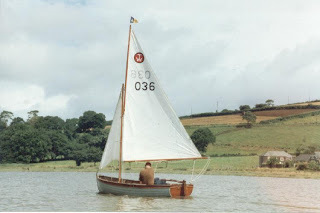 I am not by nature a negative person, but with this boat, from the little I know of her, I would have reservations about building her for my own use, and I certainly would not be able to afford a professionally produced one. 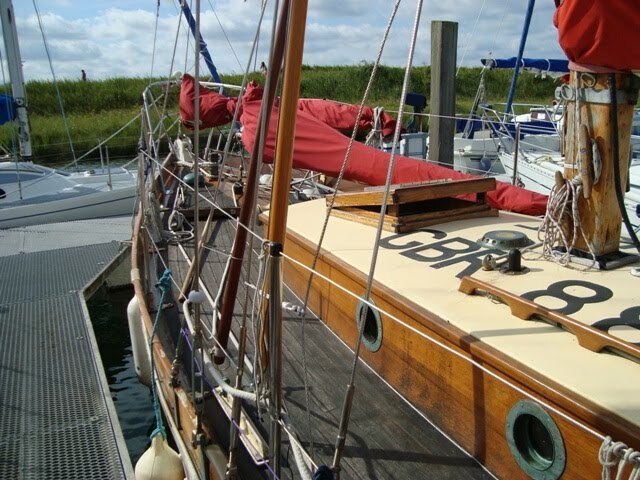 The blurb on the Web suggests she could be built for 8,000 euros, yet I spent almost as much building my 13’ 10” Paradox, which did not have expensive metal spars, domes, hatches, twin rudders and a ballasted lifting keel; neither did she have semi-hi-tech sails ………… and don’t forget to include the cost of a road trailer, if she is to be transported overland. Please bear in mind that what I’ve stated here is my personal interpretation of information I’ve gleaned from the Internet. You may have your own quite different views. I would like you to know that I have no axe to grind. I am simply trying to be objective while answering my friend’s query, and at the same time share my thoughts with readers of this Blog. The quality of build can vary considerably with ferro-cement boats, depending on the skill of the builders, and the materials used. Although ferro-cement composite construction with metallic supporting structures is considered to be a light material in the buildings industry, the weight of it precludes viable use as a construction material for boats less than 25 feet in length, but as with many rules there are exceptions. To prove the exception, there have been successful smaller ‘concrete’ vessels, such as the 12’ Jay Benford Keelboat. 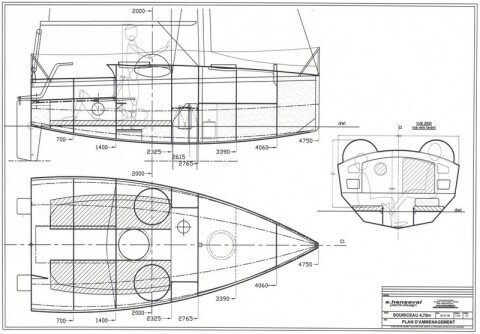 Back in the seventies, this method of construction for large yachts was favoured by amateurs, because they could obtain a high volume ferro-cement hull at a fraction of the cost of a wooden or GRP one. Another advantage of ferro-cement as a building material was that highly specialized skills were not required by the builders, and they did not have to invest in expensive tools, nor were they required to find or make a cover under which to build their dream yacht. All they needed was a plot of land with access to a main road and no restrictive byelaws preventing them from using the ground for this purpose. 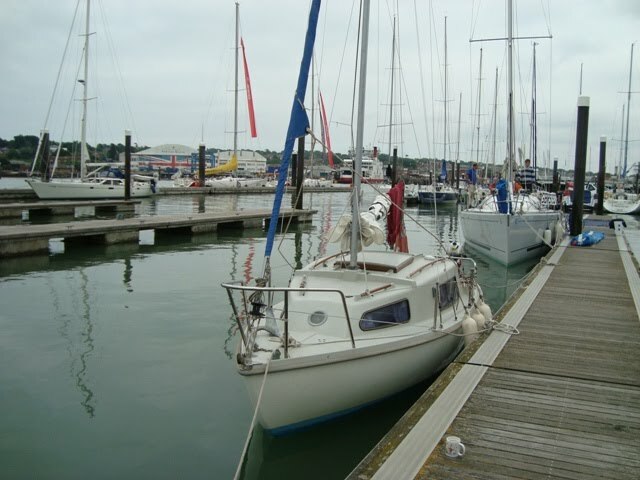 Buying a second-hand ferro-cement yacht that has been proven to be sound by the test of time may not be a bad proposition, but so much would depend upon what the prospective owner would want to do with her. If she were to be a houseboat confined to a mud berth for the next ten to twenty years, there would be little to worry about; on the other hand, if her new owner wanted to sail her across the oceans of the world, he would be wise to have the views of a competent surveyor who was familiar with ferro-cement boats. He would also be wise to research what is offered by yacht insurance brokers before investing his hard earned cash. If it were a choice of buying an amateur built ‘concrete’ boat or a professionally built one, I would most likely opt for the latter. 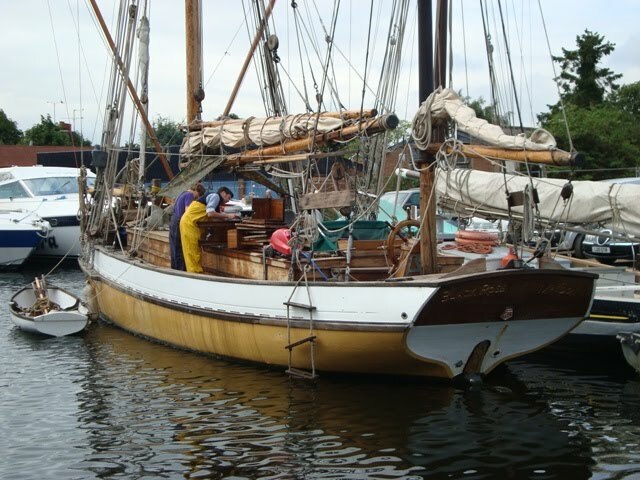 My reasoning is that she would have more probably been monitored during her construction to ensure that she met the criteria needed for an enduring product, i.e., a finely crafted vessel, almost free of maintenance, apart from a lick of paint, during her lifespan of perhaps 50 years or more. Heybridge Basin is always a fascinating place for me, because of the different yachts that turn up there, especially during the height of the season. There’s usually a good showing of East Coast gaffers that attract my attention. Somehow, I never see the ‘plastic’ production yachts with their white hulls and high topsides. The old wooden boats are the ones with character; they have evolved over time: the shapes of their hulls, their spars and sails, all suited to the work required of them in years gone by, perhaps for trawling, shell fishing or the transportation of cargo, as with the spritsail Thames barges. 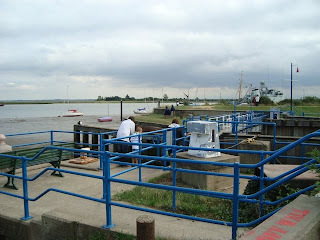 I’m leaving you here with a few photos taken by me at Heybridge Basin last Sunday. 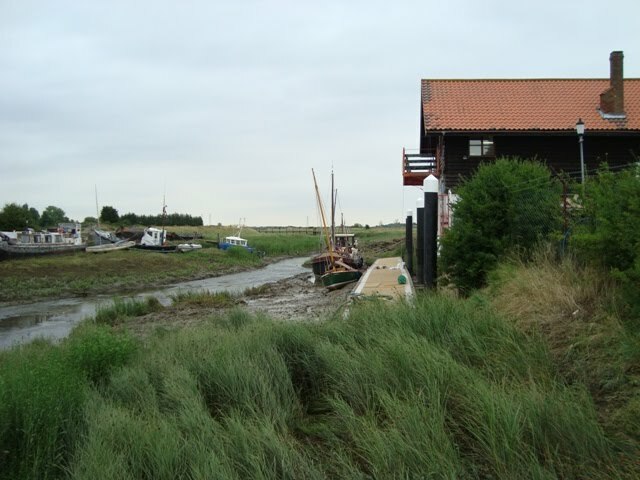 From them you can get an idea of what I’m on about, but you just have to go there yourself -sample the air, feel the breeze on your face, sit at a waterside table outside the Old Ship Inn, as you down your favourite beverage and munch away at a Ploughman’s Lunch. Relax in the glow of the warming sun; let your eyes delight in the tangle of rigging, the pattern of masts, glistening varnish, colourful paint and wriggling images reflected from ruffled water. It has been my privilege to have known Richard Wells as a friend for the last 25 years. 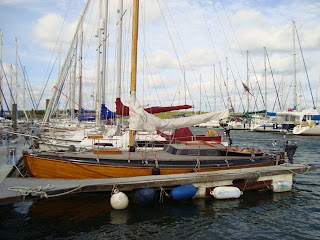 We first became acquainted when he purchased my junk rigged yacht ‘Zeta’ in 1984. Ever since, we have kept in touch, and on many occasions we have sailed together on each other’s yachts, more so his, than mine. Richard runs RYA courses aboard his beautiful classic yacht ‘Callidus’. 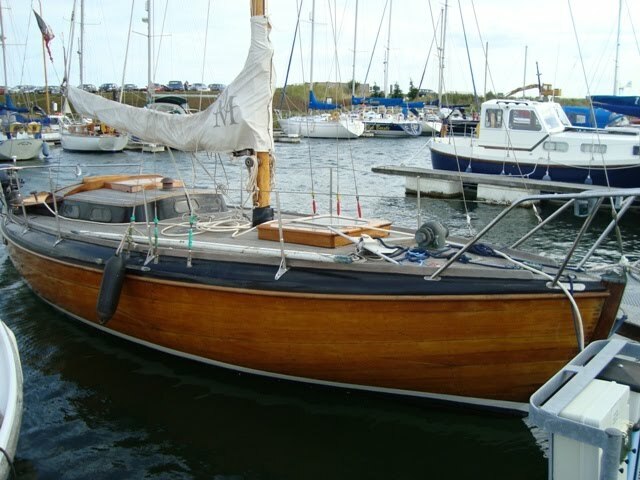 This fine wooden vessel is based at Tichmarsh Marina. While there recently, I took a few photos of this ‘creature of the sea’, in all her splendour. She really is a feast for the eyes to those who love classic yachts - she’s an iconic embodiment of what is truly classical, with a pedigree going back to an era when gentlemen of means owned these works of art fashioned by master craftsmen. 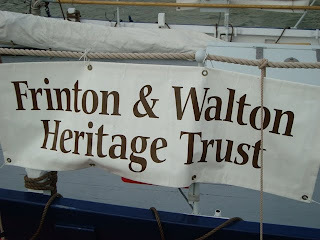 Even now, skilled shipwrights are required for maintaining such heritage vessels. 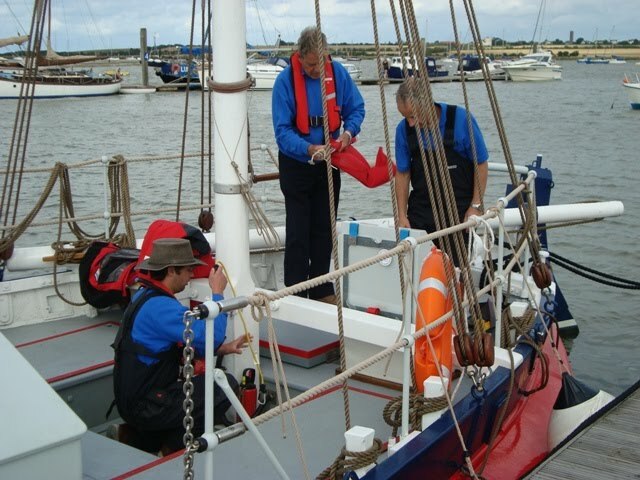 What better way is there of keeping them alive than by using them for the purpose of passing on the skills and knowledge of sound seamanship? Incidentally, ‘callidus’ is a word no longer in common usage, but in times past the adjective was applied to people who were clever, dextrous, or skilful, and such qualities were required of the craftsmen who built the enduring ‘Callidus’. This Essex village, situated where the River Crouch is narrow enough for a road bridge, has an interesting history. The first bridge, a wooden one, was replaced with an iron bridge in 1856, and replaced again with the existing one in 1872. Not so many years ago, the structure was strengthened by adding metal supports under it. The most prominent building is now an antiques centre, but in its heyday was a mill, beside which barges would berth for transporting grain and flour. 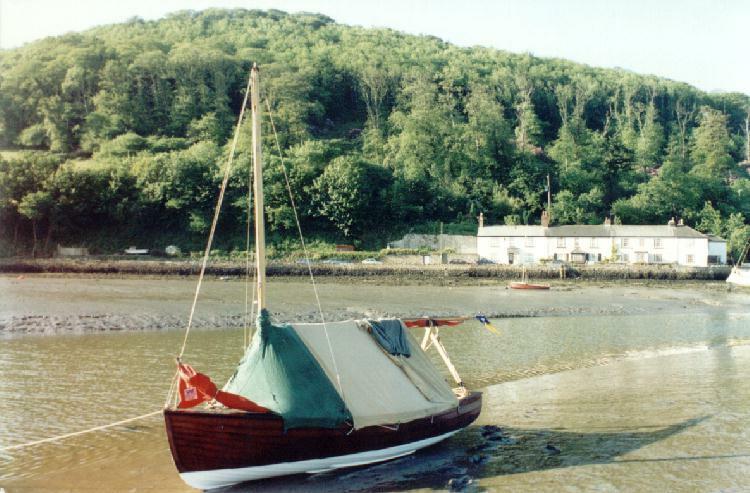 Even today, fair sized vessels can be seen moored near the bridge. One of the larger ones is the ‘Hazel May’, the motor vessel beyond the little green gaff cutter, ‘Greensleeves’ shown in the photos above. 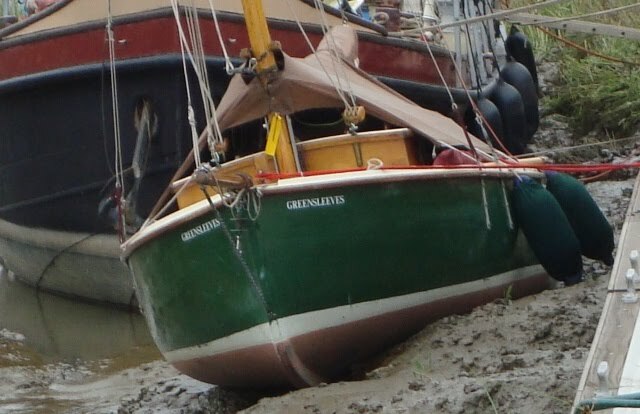 When I first saw ‘Greensleeves’, I thought she was Charles Stock’s ‘Shoal Waters’, but a closer examination revealed she was very similar, perhaps a sister ship. Getting vessels as large as the old Thames barges to Battlesbridge these days could be a bit tricky, because of silting and a narrowing of the channel, but it’s still possible at high water springs. 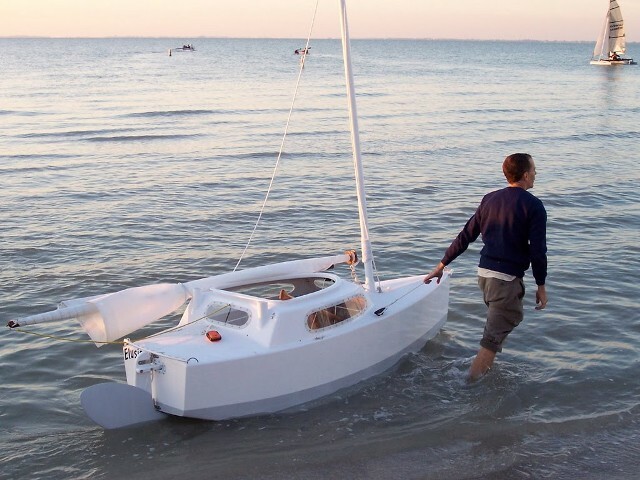 Here’s another ‘different’ sailing boat where her designer steps outside of convention and comes up with something special. 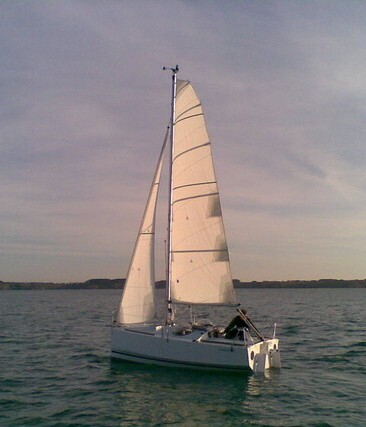 Close examination will reveal that she has a shallow, but wide cockpit where her crew can relax in an almost recumbent position, especially when the yacht is going to windward. The crew’s vision would not be impaired by the low profile cabin trunk, and he would have good all-round visibility. 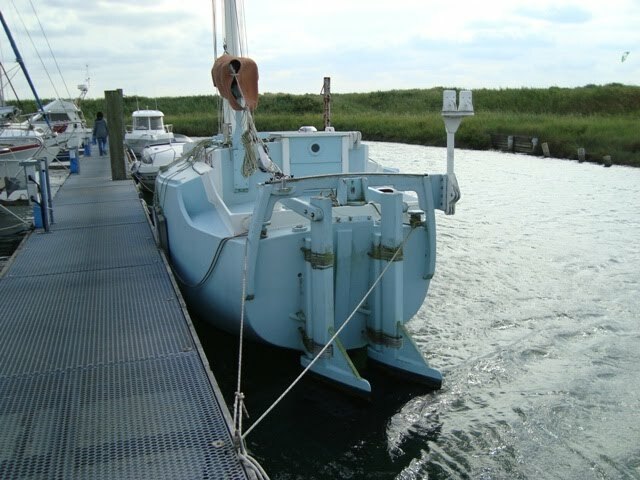 This vessel has a raised deck that is almost clear of clutter, save for the fore hatch and windlass, which is placed where it should be, away from the bow so that the crew has space for working safely when anchoring and retrieving an anchor. 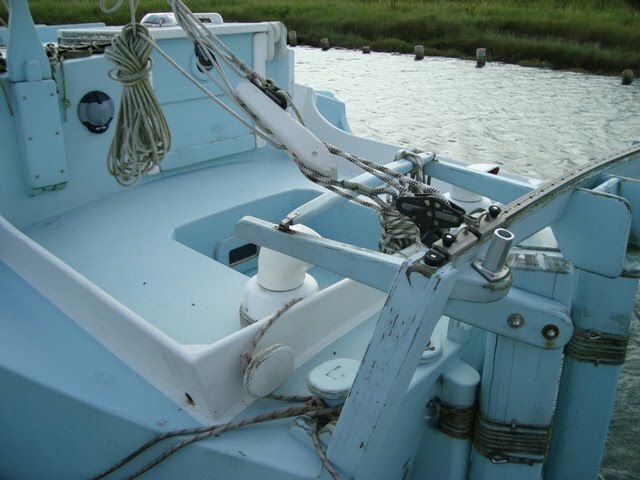 ‘Espirit’s’ stanchions and safety lines are at a good height for giving a person support as he carries out necessary tasks when working on deck. All the gear would seem to be more than adequately strong - things like the winches, pulpit, pushpit and the stainless steel rigging. The fittings are made from top quality materials and they look as though they have been well-engineered. One thing I’m not so keen on is the heavy outboard supported astern of the rudder. I feel sure an inboard engine would be much more efficient, because the prop would be lower in the water, unlike the outboard’s propeller which could break clear of the surface in certain sea conditions. An inboard engine would act as additional ballast where it is needed, i.e., below the waterline. 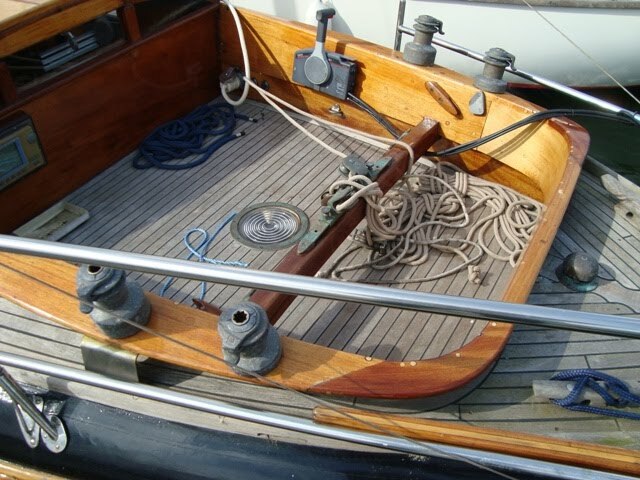 The teak decks look great, and they would not take a lot of effort to maintain - nothing more than a scrub now and again with seawater. ‘Espirit de Moitessier’ has a tattered American flag attached to her backstay, which may give a clew to the observer why she is never seen sailing out of Tichmarsh Marina where she is currently berthed. 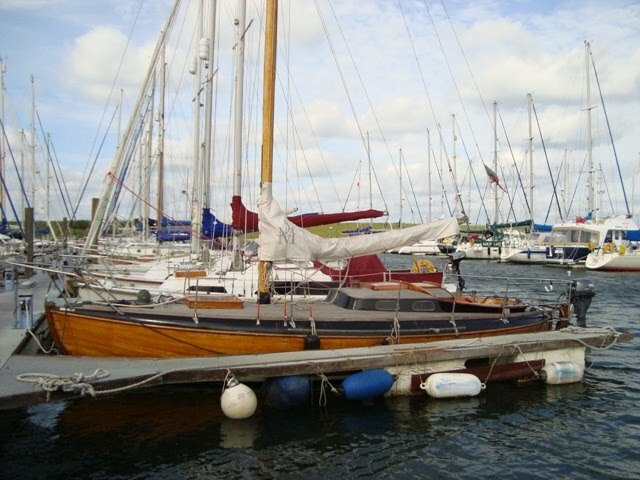 It could be that her American owner, having sailed her across the Atlantic, is not interested in day sailing, but awaits a time when he’ll have an opportunity to sail her back to the US, across the Atlantic in the spirit of Moitessier. Anything a bit different to the general run of things is interesting, but not always worth the time spent looking at. 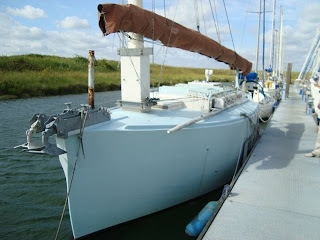 One yacht that I have seen recently and was worth examining, was the ‘Skylark’. I’ve not seen anything quite like her before. I think she must be a one-off, perhaps designed and built by her owner. 1 Why does she have twin rudders? If she had a wide stern, then I could see a valid reason for them. Two rudders double the drag, and they are not far enough apart to mount an outboard engine between them. Note that they are held in place with strops - not the usual gudgeons and pintles. 2 The mast collar, in the form of a box, combined with wedges that can be clamped in place, would appear to be a sound arrangement. A canvas or rubber upper collar may be needed to prevent ingress from rainwater. 3 The small cockpit looks decidedly uncomfortable, and there’s probably only room for one person to use it satisfactorily. Furthermore, its shallowness does nothing to make the person on the helm secure, and the tillers look really short, especially if there’s any appreciable weather helm. 4 When the crew has to do deck work, such as anchoring, there’s little to protect him. Adding to the lack of security, the side decks curve downwards -this is OK when the crew is on the windward side, but not so good if he happens to be on the leeward side! Despite oddities, the yacht appeals to me, because of her uniqueness. 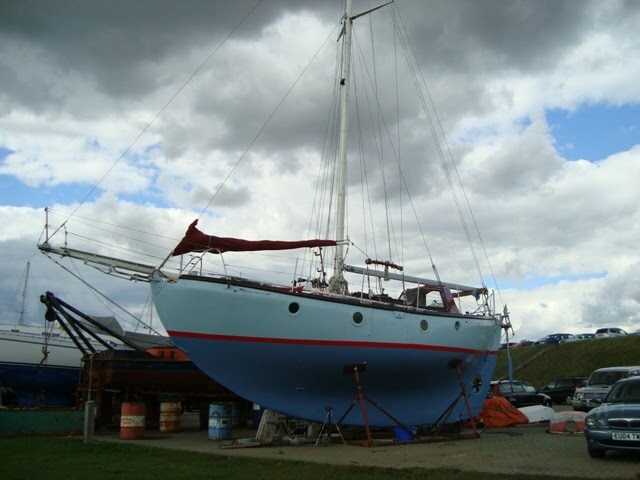 I like her high freeboard, which will help to make her a dry boat to sail, without waves and spray coming aboard. Her ample freeboard also makes for good standing headroom and loads of space for comfortable accommodation. 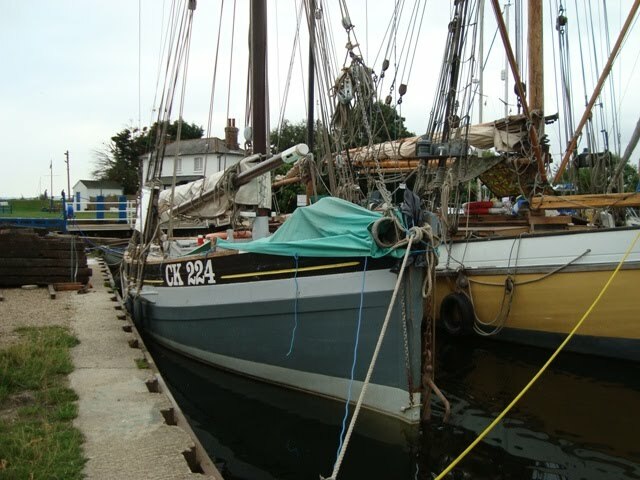 She has a very deep keel and equally deep rudders, which should help her to be weatherly, even though she is rigged as a junk. She does not appear to have an engine, because I could not see a prop. The fact that she does not have a trace of varnish anywhere is sensible for easy maintenance. Unfortunately, for reasons unknown to me, ‘Skylark’ is being neglected, so that paint is peeling in places and the wood is becoming exposed to the sun and rain. With a few things done to her, this yacht could be a very good vessel for single-handed long-distance cruising. On the afternoon of Sunday, 15th August, I was at Titchmarsh Marina where I had the privilege of speaking with members of the voluntary crew of the classic ‘James Stevens No 14’ lifeboat. This historic vessel is the world’s oldest surviving motor lifeboat. One of twenty identical vessels sponsored by a Birmingham business man, James Stevens, she’s an example of a 43’ Norfolk and Suffolk pulling and sailing type lifeboat, built by the Thames Ironworks in 1900. This gallant little ship was launched on mercy missions 126 times and saved a total of 227 souls. Her most notable rescue was when she took off 92 passengers and crew from the ‘SS Peregrine’ stranded on Long Sand Head in a force nine gale. 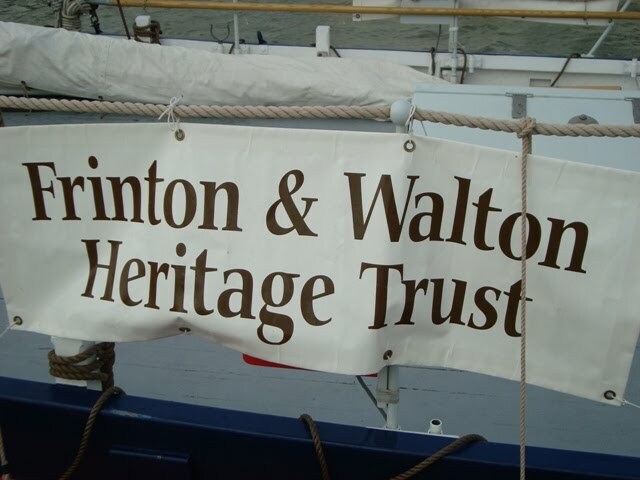 She is now owned by the Frinton and Walton Heritage Trust, and her renovation was paid for by a Heritage Lottery Fund grant of £75,000. 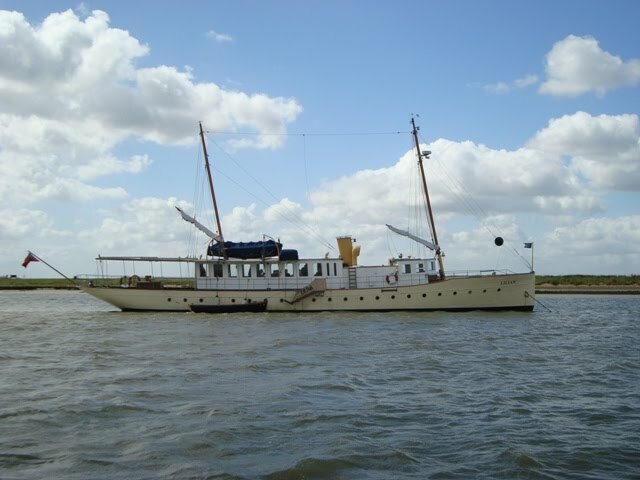 Having changed hands several times since her service career ended in 1928, she has been used as a houseboat and for transporting timber on the Rivers Blackwater and Colne. 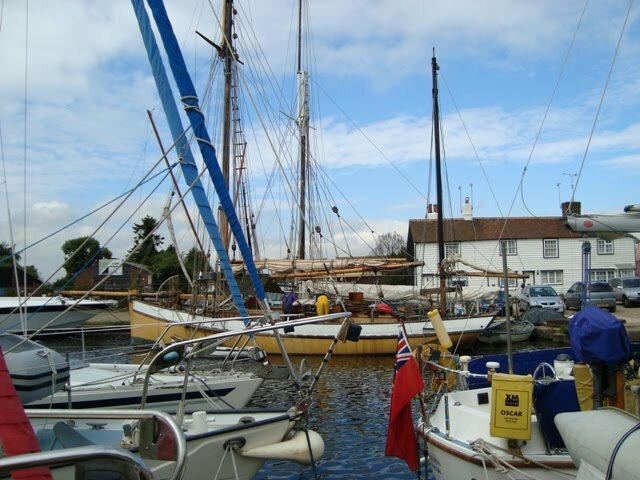 She is currently in an excellent renovated state, and she is being used as a floating exhibit that can participate in classic boat festivals and lifeboat events. 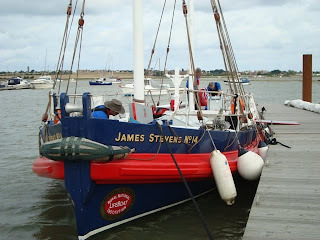 By arrangement (email: jamesstevensno14@yahoo.co.uk), members of the general public can have hands-on experience aboard her when she is taken to sea. 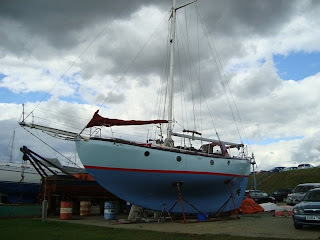 Plans are afoot for her first sail with her dipping lugsail rig.